The Kardashians were on one of their now infamous lavish family vactions. This was captured in an airing episode of Keeping up with the kardashians. Kim gets thrown into the water by her brother or her new husband (someone strong) and she is wearing her brand new very expensive diamond earrings. 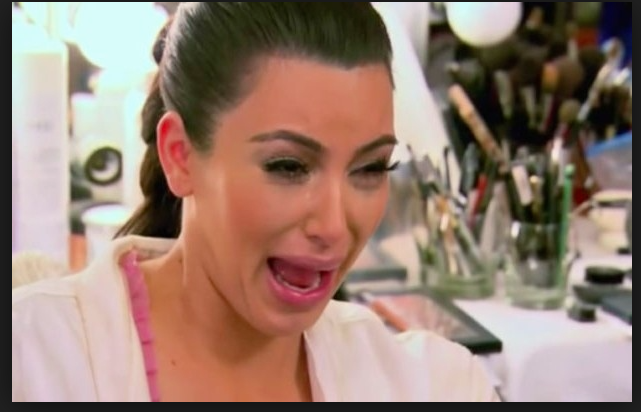 She then becomes agitated and ballistic over losing them and starts to do what she is now known for….ugly cry. Also I think this may be an origin of first world problems? 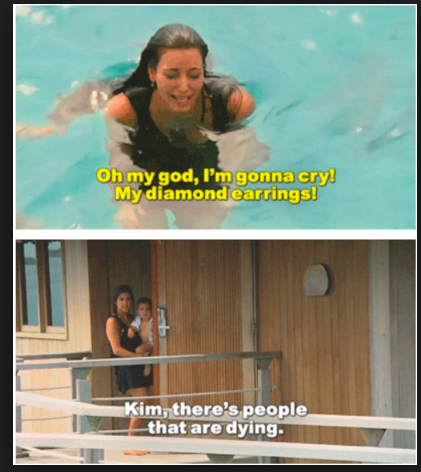 Kim is crying over the loss of these diamond earrings and trying to get her family to care as her sarcastic older sister Kourtney snipes, “kim there are people dying in the world, get over it”. This scene quickly became widespread over social media sharing site and it is a very well known scene of the KUWTK series. Below are five sources that covered the story when it first happened. Kim crying over these diamond earrings sparked many conversations about the stars ugly crying face. Even her own sisters admitted to not being able to control their laughter. Her crying face has been immortalized in many different memes and can be applied to any situation. All of the above are prime examples of how I would personally use this meme. The sharability of these images just helps people understand more of the feeling youre conveying with your words. It doesnt matter that most of the time its super extra and dramatic. Its funnnny.